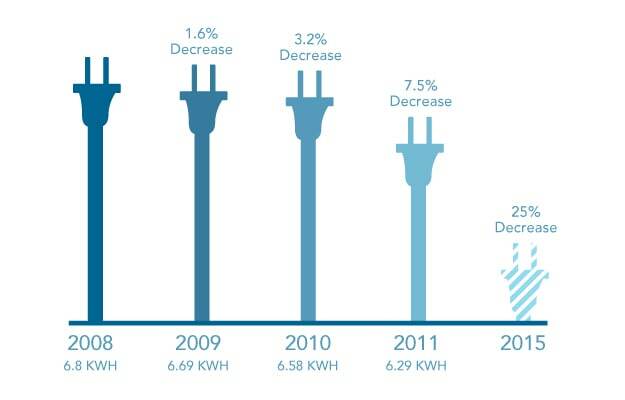 In 2011 we made good progress - our electricity use has decreased by more than 7.5% since 2009. Average electricity use per square foot/store/month U.S. and Canada company-owned stores. This year's report shows % change to 2008 baseline vs. Year of Year %. The energy used to power our stores, offices and roasting plants accounts for more than 80 percent of our direct carbon footprint1. As such, we are focused on multiple fronts to reduce our energy use. In late 2011 we rolled out a large-scale pilot program to test energy management systems across the United States. This technology reduces energy consumption by remotely monitoring and controlling our stores’ heating, ventilation and air conditioning (HVAC) equipment – the single largest source of energy consumption in our stores. We’ve further reduced our energy consumption by replacing incandescent and halogen lighting with more efficient LED lighting. We completed LED lighting installations in more than 7,000 stores in Canada, China, Germany, the United Kingdom and the United States through 2011. While our stores were already utilizing energy-efficient compact fluorescent lights for a number of applications, installing LED lights has led to an additional average 7 percent decrease in our stores’ electricity consumption. Although we are pleased to see our electricity use decrease by a total of 7.5 percent since 2008, we need to continue to make improvements in order to reach our goal of reducing electricity use by 25 percent in company-owned stores by 2015. Additional improvements underway include upgrading our signage to LED lighting, driving our suppliers to provide equipment that operates at leading-edge efficiency levels, and replacing existing equipment and appliances with high-efficiency alternatives as they reach the end of their useful life. We will continue to work cooperatively with organizations throughout the world to identify, test and implement the most effective and sustainable energy efficiency initiatives. 1 Findings from Starbucks 2010 greenhouse gas inventory using the World Resources Institute’s greenhouse gas protocol. Learn more about our current energy conservation activities.